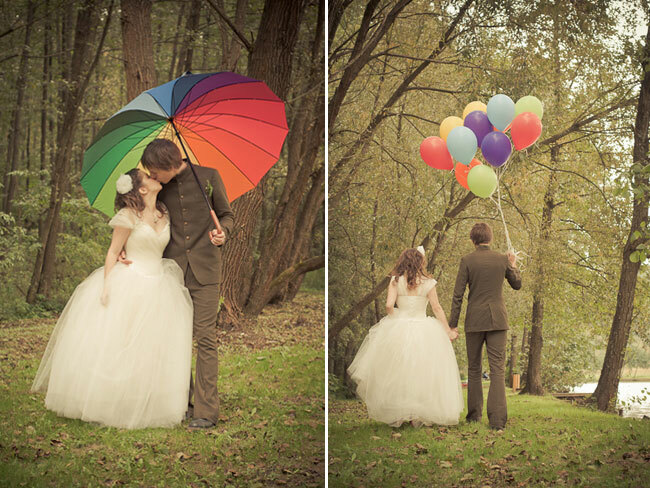 Usually we see weddings with one or two or maybe three main colors. Today’s wedding is a little different. 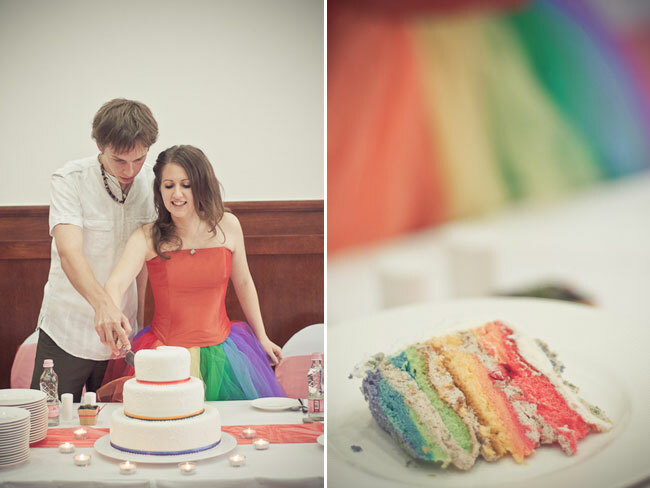 Brigitta and Viktor wanted a colorful wedding so they decided to have every color of the rainbow! 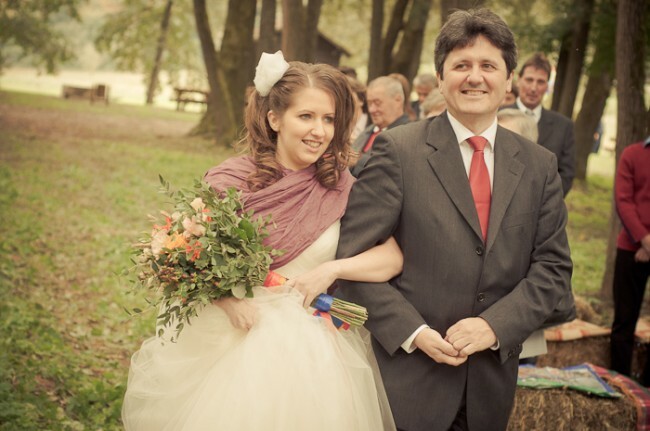 The got married at the Hotel Kardosfa in Hungary. The brides dress was made by Anita Benes from Daalarna. The seats for the ceremony were hay bales with pillows. We are crazy about this shot! 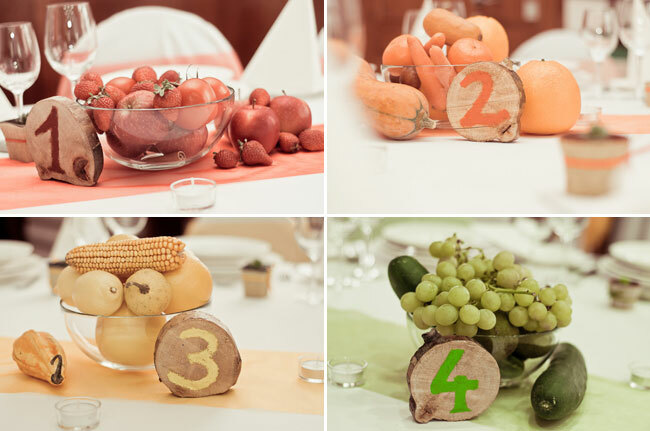 Each table had a different color theme with centerpieces made of fruit, veggies, and wood table numbers. The name cards were rocks the bride painted with each guests name. We LOVE the inside of the cake! The bride changed to a new dress made by Timi Czinder. How wonderfully fun and creative! Simple and natural. Love it! 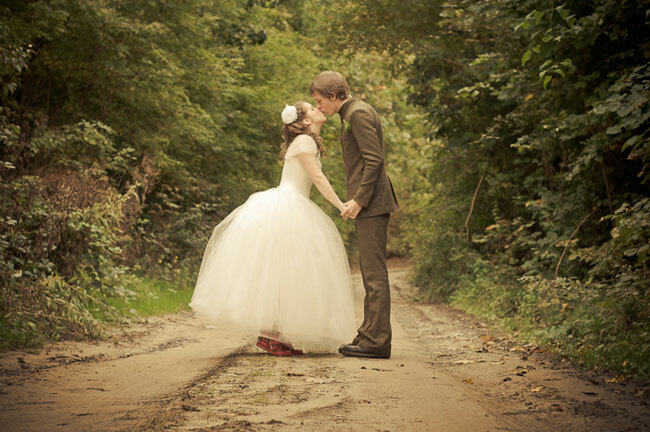 oh my goodness… this is such a beautiful wedding filled with such personality & originality! HA! LOL So fun! 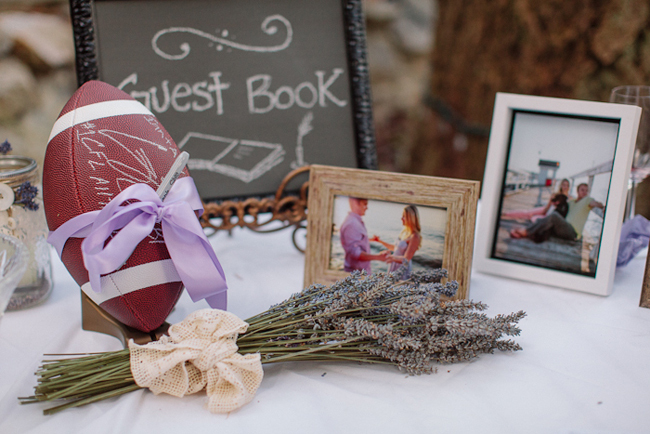 What a fun wedding and so fun to plan I bet! 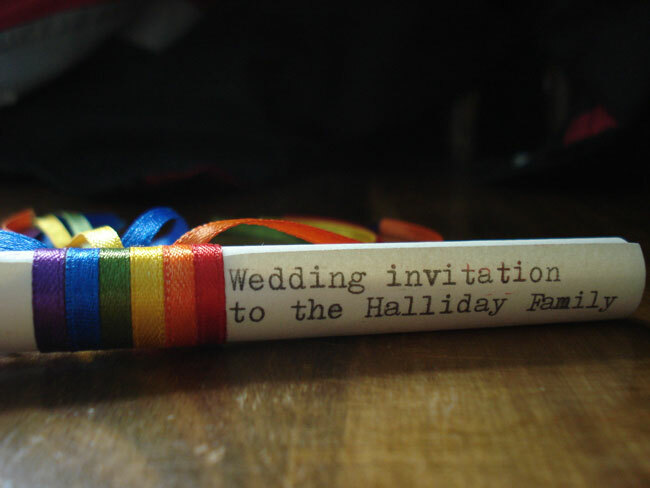 The ideas are endless for a rainbow wedding! Great idea! What an adorable wedding! Rainbow-how charming! So many wonderful details here – her dress, cake, diffrent colored tables! Oh just love the rainbow of colors. I was thinking of putting something together with rainbos colors, and after seeing this…I just might have too! This is so much fun! I love the Reception dress! i LOVE this so much. 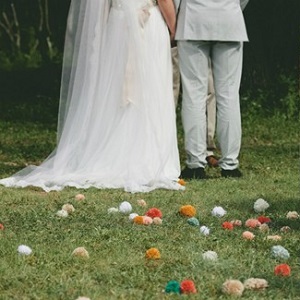 such a great way to incorporate color and yet not feel overwhelmed. and of course i love the boots! love how cheerful and whimsical everything is!! glad to see a bride embracing such a colorful palette!! how fun is her rainbow dress? love how each table had its own color!! I’m really happy to see my pictures here! It was fun to take pictures with Brigitta and Viktor! 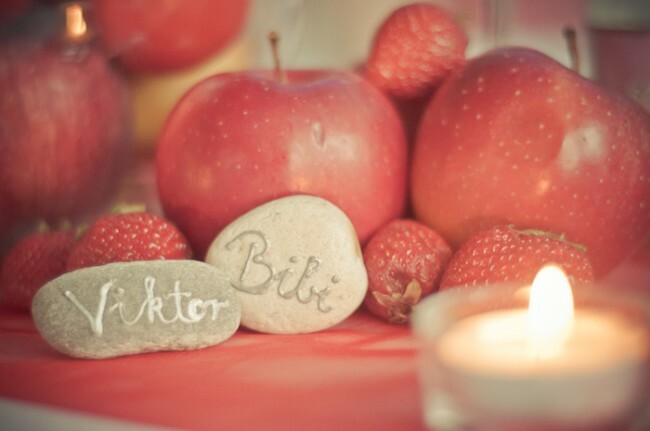 What a beautiful couple Brigitta and Viktor make. 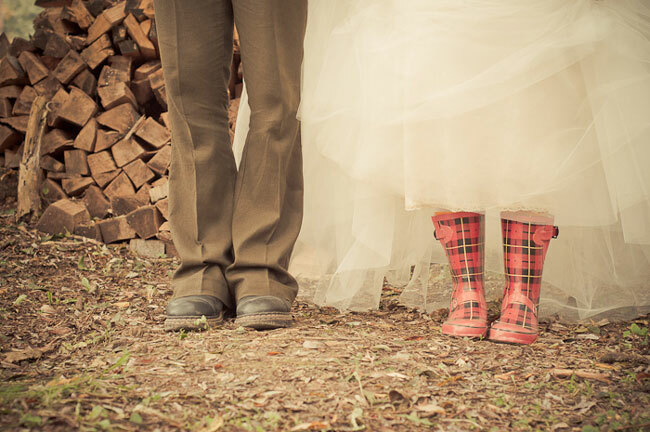 I could look at these photos for hours… Absolutely beautiful wedding and gotta love the wellies shot too!